The Icelandic people are big fans of myths and hard work. One famous Christmas character is the scary Yule Cat who eats children who haven't worked hard enough. Basically, if you have finished all your work before Christmas you get new clothes and you are safe. 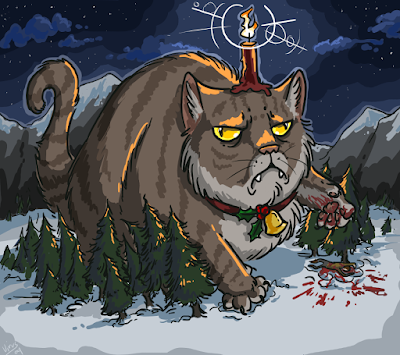 The scary Icelandic Yule cat only looks for the lazy ones in old clothes.